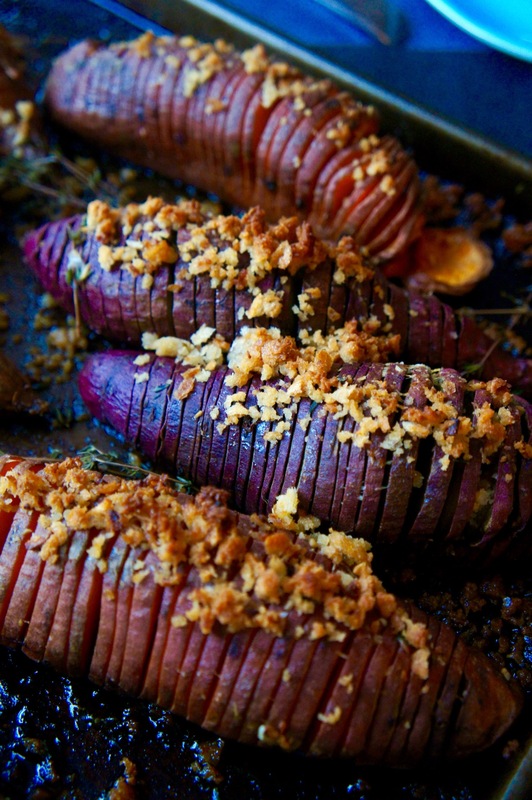 I’ve seen hasselback potatoes in recipe books and on social media but had never eaten them until now. In all honesty they seemed like a bit of a hassle….but I’ve been seeing them everywhere so they must be alright, and gosh darn do they look pretty, so I thought I’d give ‘em a go. Much research has also given me a seriously easy chopping technique (a ‘hack’ I believe is the right term) and it turns out they are definitely worth the hassle after all. 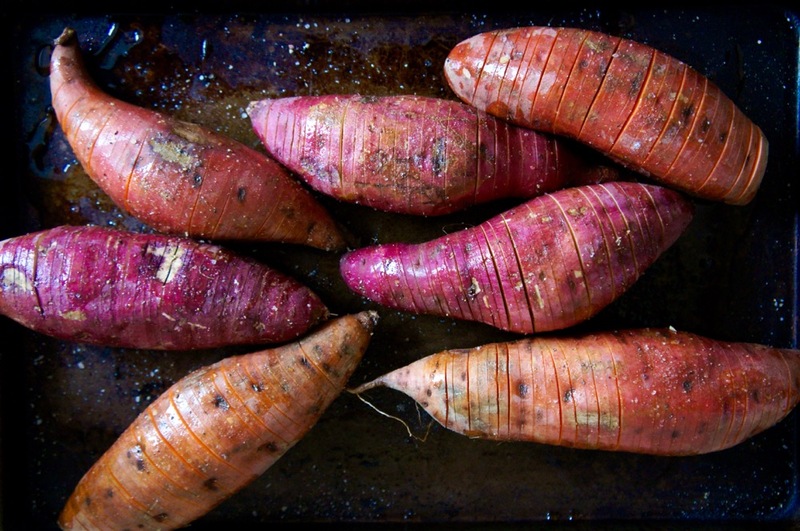 My good friend Sophy cleverly recommended I try sweet potatoes instead of the classic tatty and luckily my local Aladdin’s cave, Tooting Arena, had a big pile of beautiful, gnarly, purple and red sweet potatoes for me to delve into. 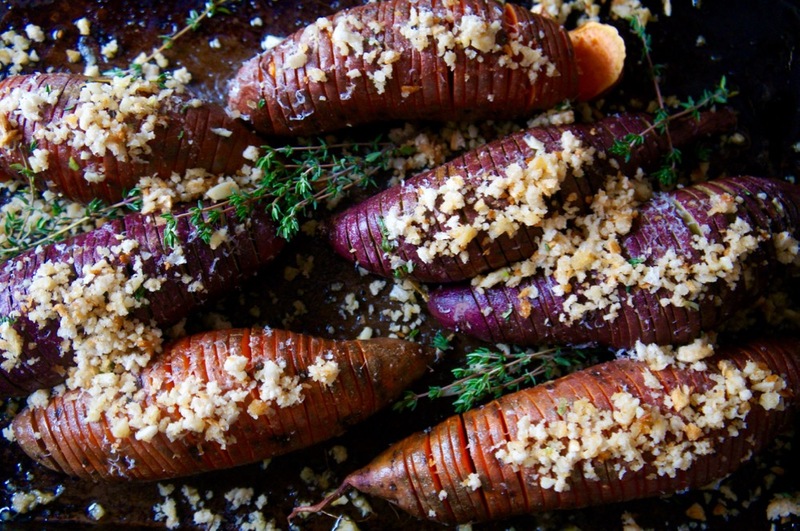 As we all know, sweet potatoes don’t crisp up quite as well as their paler cousins, so I’ve added some crispy garlic butter crumbs for the crunch and because, well, who doesn’t love crispy crumbs? 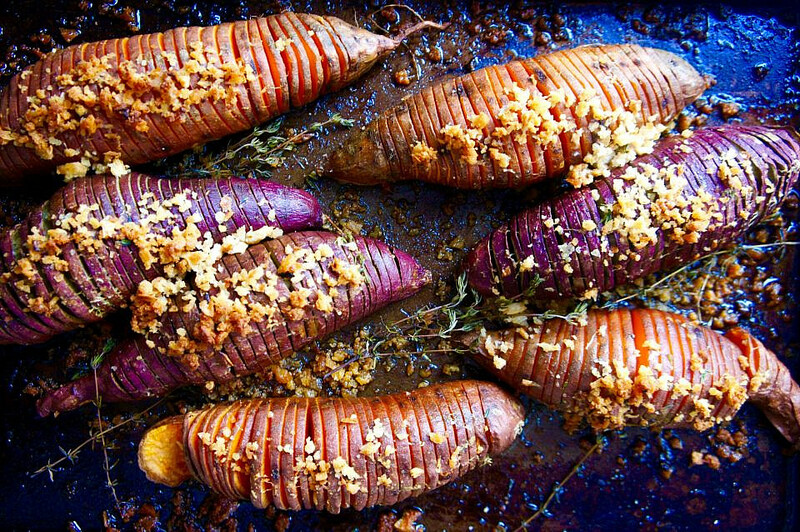 The sweet potatoes turn out really buttery and glorious; the general consensus being that these are perfect lazy Sunday potatoes because, really, when you come to eat it, all the chopping has already been done for you. You only need a fork for shovelling and you’re good to go. 1. SLICING METHOD: Preheat your oven to 220°C(430F). Place two wooden spoons side by side to create a channel for your potato. The height of the wooden spoon handles will create a barrier to stop you slicing the whole way through. 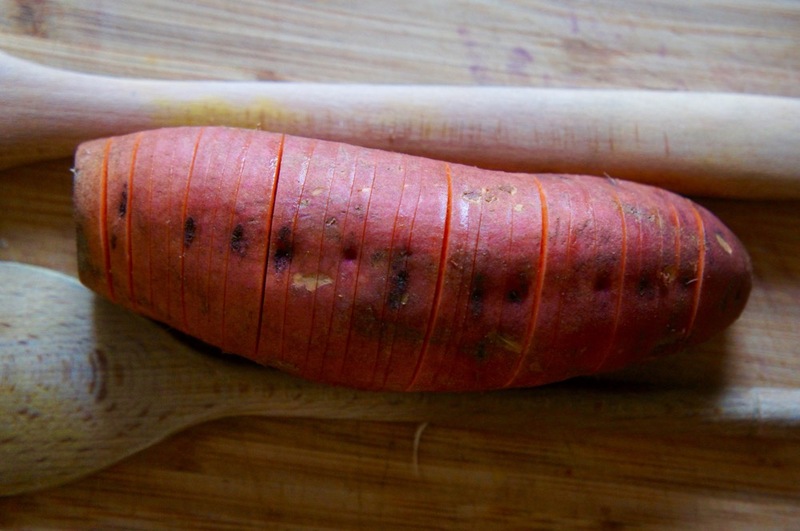 Place your sweet potato between the two wooden spoon handles (as below) and slice the potato in small 3mm – 5mm sections all along, slicing until you hit the wooden spoon handles (so not all the way through). Repeat for all your potatoes. 2. 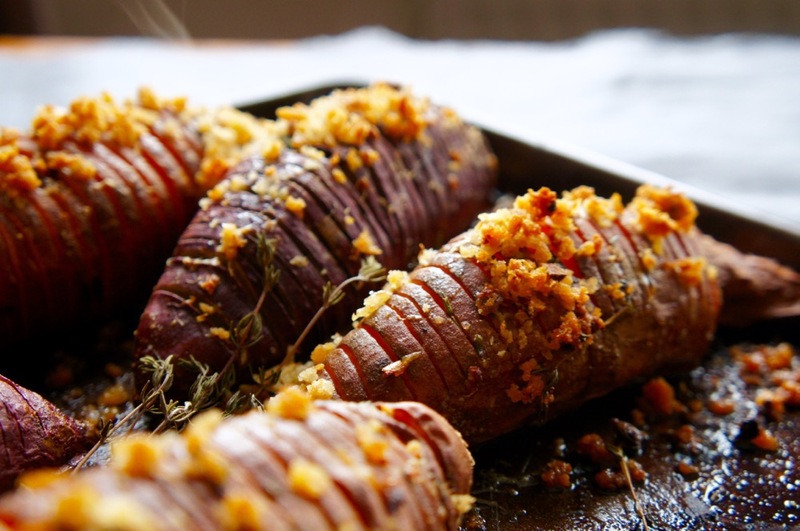 DRIZZLE & BAKE: Drizzle your hasselback-ed potatoes with some rapeseed or olive oil and season with salt and freshly ground pepper. Bake for 20 minutes in the hot oven. 3. BUTTER & CRUMBS: Melt your butter in a little saucepan and make your crumbs if you haven’t already, by pulsing in a food processor. When your butter is hot and melted, add your chopped garlic, thyme leaves and sprigs. Remove the butter from the heat and leave the garlic and thyme to infuse for a few minutes, swirling the pan occasionally. 4. 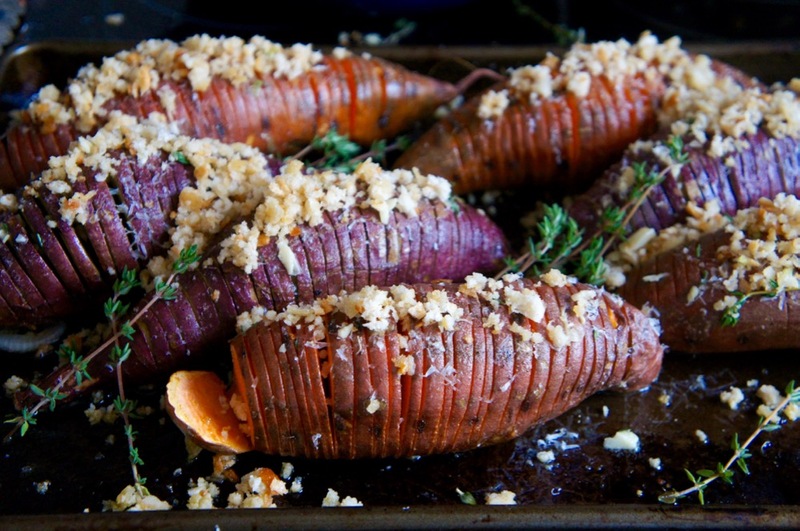 BUTTERY GARLIC CRUMBS: After 20 minutes in the oven, remove the sweet potatoes. Using a teaspoon, drizzle the infused butter over the potatoes, getting in between the slices with the butter, bits of thyme and garlic. If you can, spread the layers out a little, but it can be a bit tricky (I wasn’t that successful). You can also place an upturned fork underneath the centre of the potato to raise it a little and spread out the slices. Sprinkle your grated Parmesan along the top of the potatoes. When you have a little butter left in the sauce pan, put a few handfuls of breadcrumbs in the pan and toss them so they soak up the remaining butter and catch the garlic & thyme pieces. 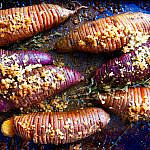 Season the crumbs with salt & pepper and sprinkle them along the top of the sweet potatoes and around them a little. 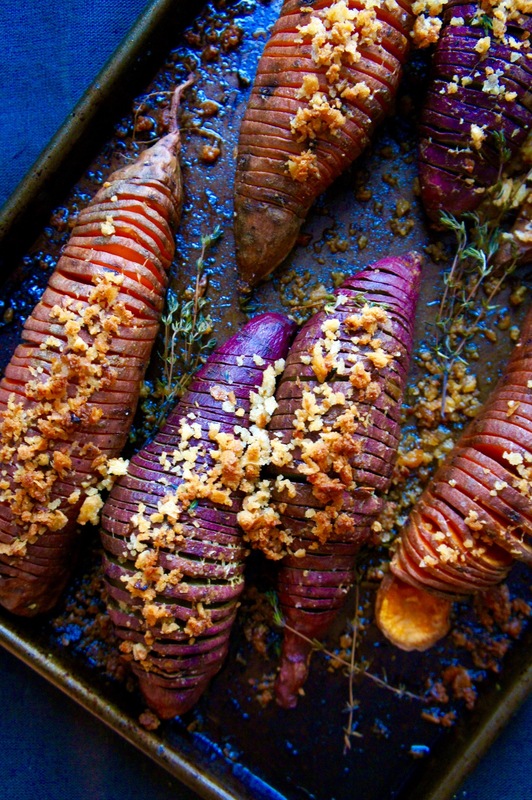 Put back in the oven for 20 – 30 minutes until the crumbs are golden brown and crispy, and the sweet potato is soft in the centre.